It seems that 3D printed shoes are one step closer to reality. This is a timely story for me as I just went shoe shopping this week... Every time I need new tennis shoes, I go through the same routine: choose from the limited selection of wide sizes and then, through process of elimination, find a pair that I can tolerate. I speed walk, so the shoes have to be large enough to fit my feet but be snug enough to stay in place while I put them through their paces. Based on this week's workout, the pair I just selected are not working out. So I'm always interested in hearing about 3D printed shoes. The Futurecraft 4D shoe's introduction is planned for 2018 with the intention of offering shoe soles for individual fittings and limited editions. The partnership with Carbon should allow Adidas to reduce the time it takes to produce shoes by additive manufacturing. Its 3D printer design is reportedly 10 times faster than traditional 3D printer designs, printing soles in as little as 20 minutes. When I worked for Nabisco, we had large robust sieves that would prepare flour being drawn from our 7-story flour towers prior to discharging into the weigh scales and mixers - several hundred pounds each batch. The contraptions looked like very large metal boxes that shook and rotated violently to sieve the flour. So it makes sense to me that a similar process would be recommended to pre-treat metal powders before being sintered into a 3D print. In fact, a couple of challenges using powders in manufacturing processes are material purity and particle size. 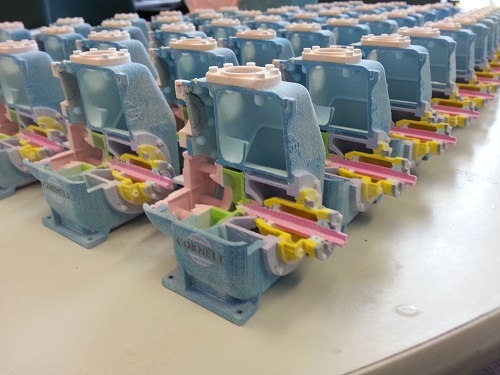 Apparently Farleygreene has introduced its SIEVGEN 400-US specifically to address these concerns for DMLS additive manufacturing. According to Farleygreene, when in normal use the system provides for a completely sealed and dust tight process. The feed hopper is docked into place to feed the sieve unit with a self-sealing interface and the media is introduced through an internal metering device designed to ensure the optimum screen dwell time to recover as much useable material as possible. When you are hitting a potentially explosive metal powder with a laser, powder consistency and purity are obviously important material attributes to control. Laika Debuts First Fully 3D Printed Puppet in "Kubo and the Two Strings." The film, which took 94 weeks and 70 rapid prototyping specialists to complete, shows in theaters on August 19.